MTN onDemand mobile phone recharge is now easier, faster and more convenient by dailing short USSD code from the comfort of our homes, office or workplace. 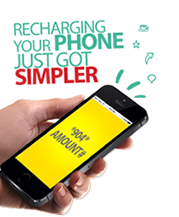 Using simple USSD code, you can now recharge your MTN line from your bank, no recharge card needed, just your mobile phone and recharge USSD code. This one USSD code is used by all the eligible banks. With MTNOnDemand feature, your hands are not tied to buying only from recharge card vendors or shops. There may be a time when you need to make a quick recharge but feel too lazy or tired to go out to get the card or at wee hours in the night when there are no shops or vendor, you end up borrowing from MTN. Those are definitely over now! The only downside to this is that this onDemand feature is eligible with just five banks of about 20 banks in Nigeria. MTN onDemand not available for your bank? you can also dail *131# to recharge or buy airtime, data plans, check data balance and perform other similar transactions available on the on-screen display of your mobile phone using your MTN line. Moreover most banks also have their customized short codes (USSD) for buying airtime from your account. Pls admin how do I change airtime to real money to my acct? Thanks. Please add the various customize bank short codes.